Have you ever wanted to represent your favourite League of Legends character with a bit of jewellery? Perhaps some jewellery that can cost upwards of $4,000? That price may make your credit card slink away in fear, but that won’t stop you admiring That Jewelry Designer’s newest creations. If you’re just starting out on playing League of Legends, here’s the best champions for beginners. He’s been showing off his new ring inspired by Syndra over on the League of Legends subreddit, made using silver and amethyst. It’s a fancy little thing, but That Jewelry Designer didn’t give a price for this one. For an idea of what his rings cost, he did show off the newest ring based on a legendary skin in the game. DJ Sona’s ring consists of a whopping 114 stones and is the one you can see above, The Jewelry Designer estimates it would cost between $3,000 to $4,000 just because of the labour required in inserting the many stones. He’s actually made a lot of these before – some of which are actually available on his website. 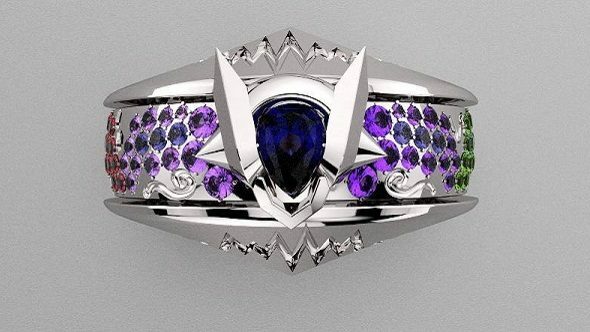 His Facebook page has all of his past designs (this Vi-inspired ring is brilliant), and you can read more – as well as contact him if you want a custom piece – plus order something right here. Let me know if you want to buy me Taric’s Lost Ring for $4,125.